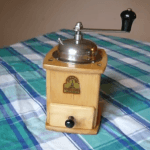 I want to give a lesson on coffee grinder history, because I feel like some people really don’t know the intriguing back story of these handy and often quite beautiful devices we call coffee grinders. 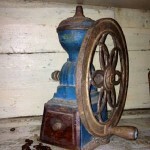 If you weren’t aware, the history of coffee grinders actually goes way, way back. 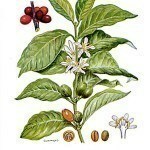 First, in order to talk about the first coffee grinders, it makes sense to talk about the origin of coffee. 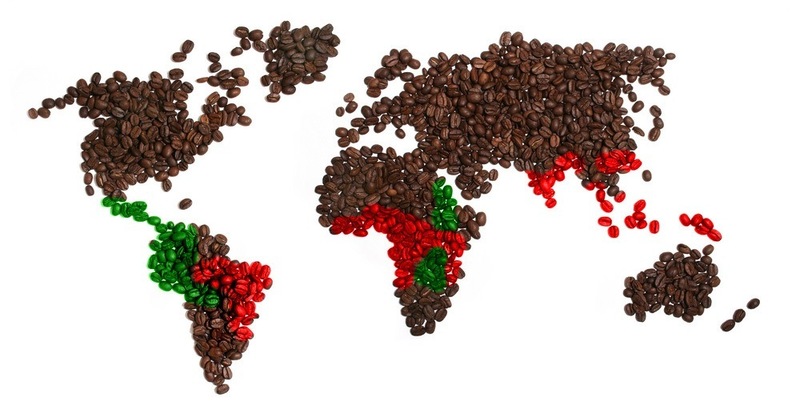 Have a look at this cool map of the world in the form of coffee beans, where it shows the two main types of beans, Robusta (in red) and Arabica (in green). This map is basically a creative interpretation of the “Coffee Belt”, which indicates where coffee currently is grown, but it also sheds some light on its origins as well – which is to say, Africa, and more specifically – Ethiopia. From the time of the ancient Ethiopians, back in 800 A.D., people have been grinding coffee beans into a fine consistency in order to enjoy the delicious drink they discovered. 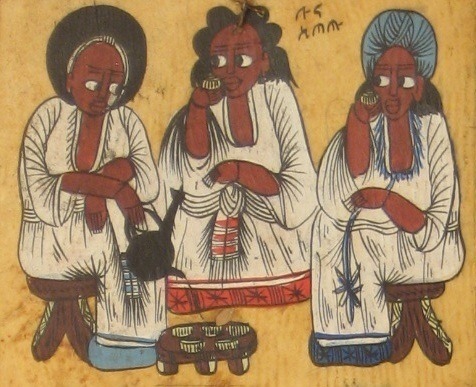 As you will see in the following video, Ethiopians have a very long and intimate relationship with coffee which is almost a religious experience unto itself, and they know countless ways to prepare it as well. They even use parts of the coffee plant that most people would never think of using. Take a look! To this day, Ethiopians take their coffee very seriously, and even have a ceremony dedicated to coffee, which involves roasting fresh green coffee beans and creating an intoxicating waft of coffee aroma before serving up some of the finest coffee you’ll ever taste. Here’s a video that explains the ceremony rather well, and will have you wanting to give it a try sometime. As you can see, Ethiopians clearly love their coffee. Well, its no surprise, as their land was the birthplace of the plant, and continues to generate delicious coffee which is shipped worldwide for our enjoyment. Maybe you’ve heard this tale and maybe not, but it is looked to as the “origin” story of coffee, and it features a simple goatherd named Kaldi who once lived in Ethiopia in around 800 A.D. and traveled around with his flock of goats. Did Goats First Discover Coffee? 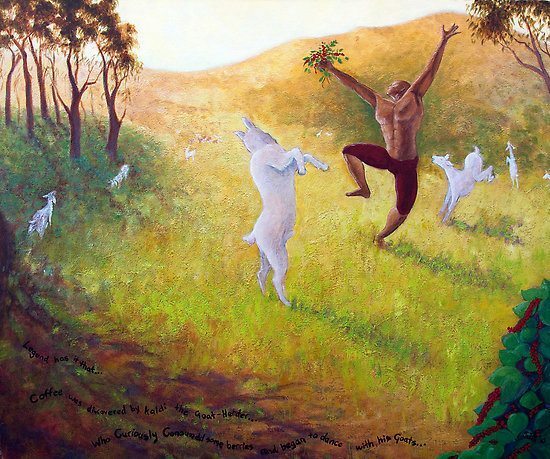 As the tale goes, Kaldi noticed his goats were acting a little bit more excited than usual one day, as they were dancing and frolicking about. Putting two and two together, Kaldi noticed they had been munching on some ripe red cherries from a particular plant, which turned out to be the coffee plant. Goats, if you know any, have a habit of eating anything. Kaldi, deciding if it was good enough for his goats then he may as well try a few, then tried the coffee cherries and he and his goats danced and frolicked together, having discovered this exuberant new fruit that made their passions roar. This, of course, was coffee. In case you missed it in the previous video, here is a brief video showing the Legend of Kaldi. As that tale continues on, monks, known to be attuned with the divine spirit, then took a hint from Kaldi and began sampling the berries, and using them for different purposes, such as a popular coffee-derived wine at the time. From there, the word was now out that these berries were certainly sensational as can be, and they became of the cultural fabric – first in Africa, and then around the globe. As it turns out, back in days of yore, coffee was treated more like a meal than the delicious beverage it is today. The ancient Ethiopians would crush up the fresh berries, and then wrap it up with fat (not your typical snack here in North America), in order to make it into something edible. Maybe it was their equivalent of an energy bar, which is not a huge stretch when you think about it. This makes me wonder, were ancient Ethiopians looking at these as more of a necessity, like lembas bread in Lord Of The Rings (sorry, I’m a nerd and that’s the only comparison I can think of)? In case you don’t know what I’m talking about, here’s Frodo and Sam talking about the renowned bread that can sustain you when you’re on a long trek. Ok, enough about LoTR, I’m wondering… were these coffee snacks which were wrapped in fat meant more for human sustenance, or were they more of a treat? This coffee history buff can’t say that she knows the correct answer to this question, but it is a curious thing to snack on. 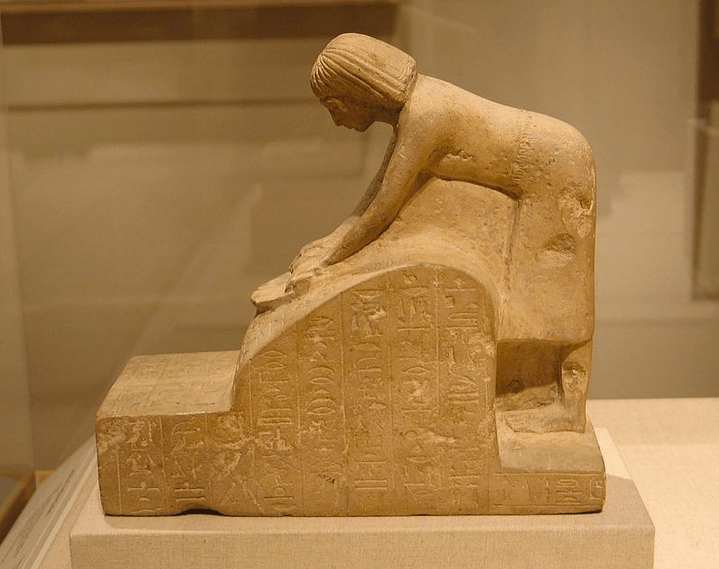 Yet, certain stones or pieces of wood were selected to fulfill their purposes – obviously people must have had their favorites, so you might say this was the beginning of “style” when it came to coffee grinders. 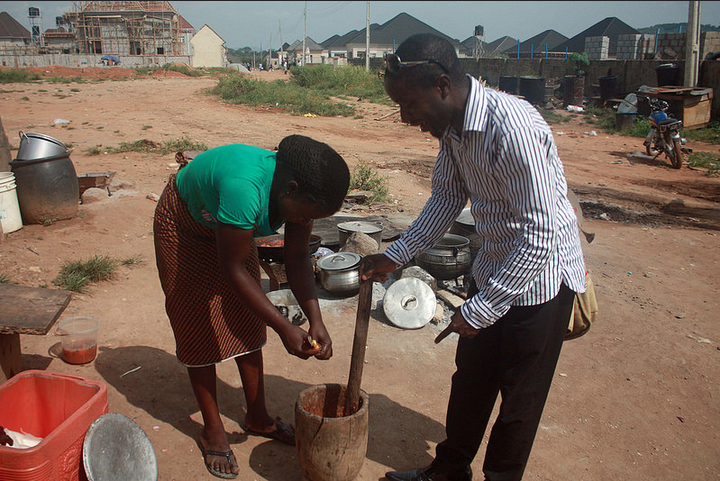 Even up until present day, things like coffee are still crushed by this mortar and pestle method in certain places. Hey, when it works, it works! 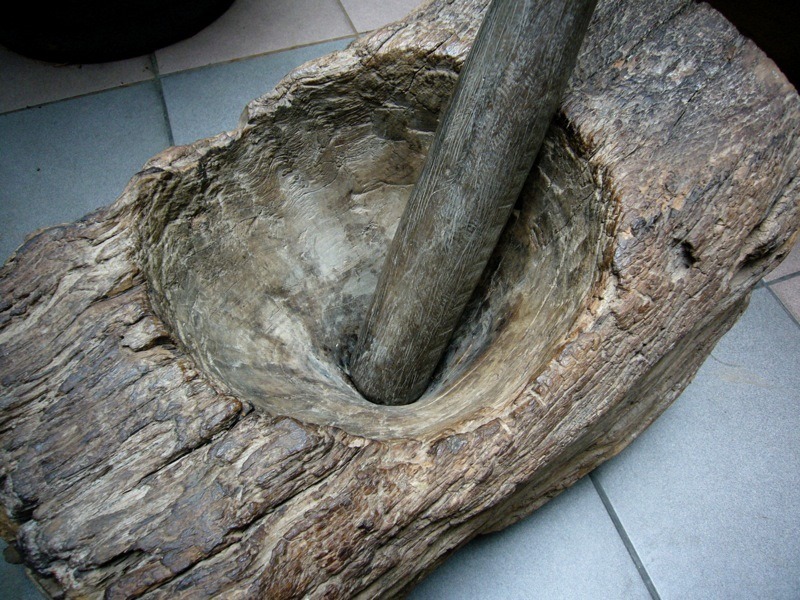 Taking us back in time much further, the concept of the mill was introduced by the Greeks sometime around 1350 B.C. To clarify, a mill is defined as a machine that crushes a substance down into a fine powder. Here is a video showing basically what a mill does. As the millwright says in this video, “…nothing added, nothing taken away…” Its worth watching, because this is how coffee grinders were developed – to be mini mills dedicated to grinding coffee. As you can see from this video, mills can be rather large, and very powerful. They operate slowly and regularly, and this is a key point, because it is true with coffee as well. We don’t want our coffee to be ground up too fast. 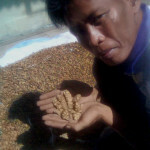 In the case of a coffee grinder, we are talking about a small-sized mill, compared to a giant grain mill as seen above. 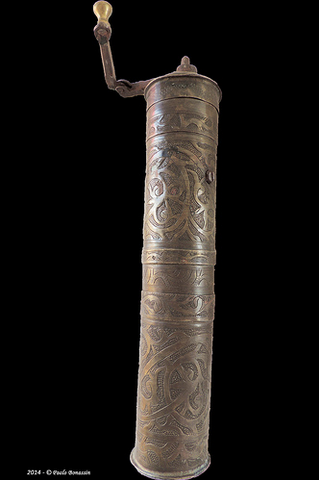 The first spice grinder was invented in the fifteenth century by either the Turkish people or the Persians – there is still some debate over this. The Turks, like the Ethiopians, treat coffee with a huge amount of respect. Coffee is involved in their day to day life in a very close way, and it even finds its way into their wedding ceremonies and many other events. This next video takes you shows you what coffee really means in Turkey, showing off all of their elaborately designed coffee accoutrements. Also, you can see some of their other coffee rituals, from fortune telling to engagement ceremonies. This really is a fascinating look at how coffee factors into an entirely different cultural experience in this place. If you’ve been to Turkey, you’ll know how beautiful the country is. They have a love for very ornate and beautiful objects, with a lot of unique design work and attention to detail – just look around Istanbul and you can see it is a feast for the senses. Interestingly, it is this appreciation of aesthetic beauty that sees certain design elements finding their way into the world of coffee, and, specifically, grinders. The Turks, we shall say, invented a type of grinder that was no doubt used for both coffee and spices (as Turkey is well known for both), and have a certain lavishness to it. 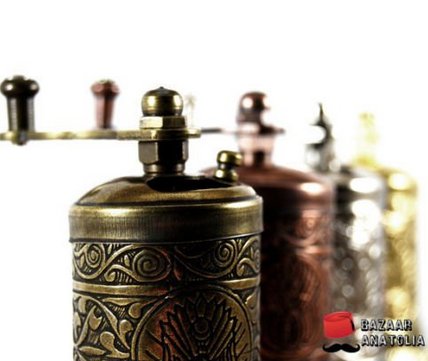 These grinders were (and still are) stunningly made, and they are sold around the world, with many copycats trying to capture authentic Turkish and Persian design elements which have now been around for hundreds of years. They also innovated the design as well. 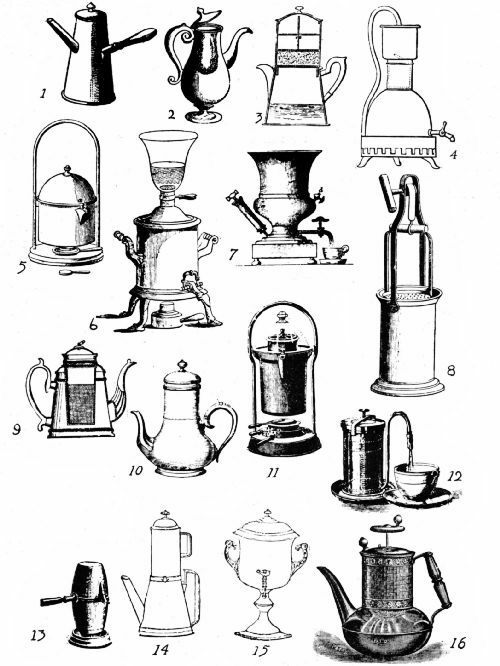 One example of such a design improvement is that they were able to design the tall, cylindrical coffee grinders we see everywhere now today, as well as introduced a functional grind receptacle, as well as other new types of handles and hidden pockets. This was also around the same time that Middle Eastern kitchens were being updated to include such things as coffee bean-roasting braziers, which would slow roast beans over a flame and be ornately designed as well. 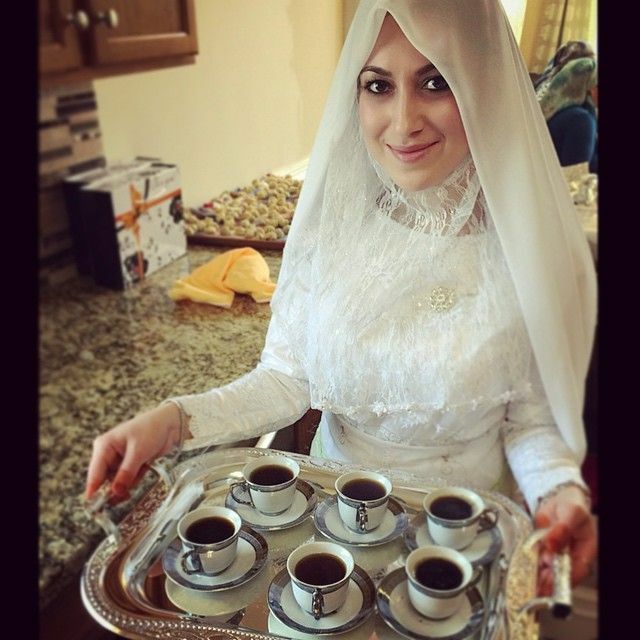 Not only this, but large, elaborately decorated and hand-crafted Turkish serving sets began to appear, and soon, between the coffee & spice grinders, their unique serving sets, and the coffee pots, coffee is very much “their” drink. At this point, we shift our focus over to the western Europe and move ahead about 200 years. In the year 1665, a man by the name of Nicholas Book, from England, claimed to sell the only coffee mill which was specifically designed for grinding coffee. A bold claim, to be sure, but it certainly lends credence to the fact that coffee has, by now, spread throughout different parts of the world, becoming popular nearly where ever it goes, and this includes England by the 17th century. 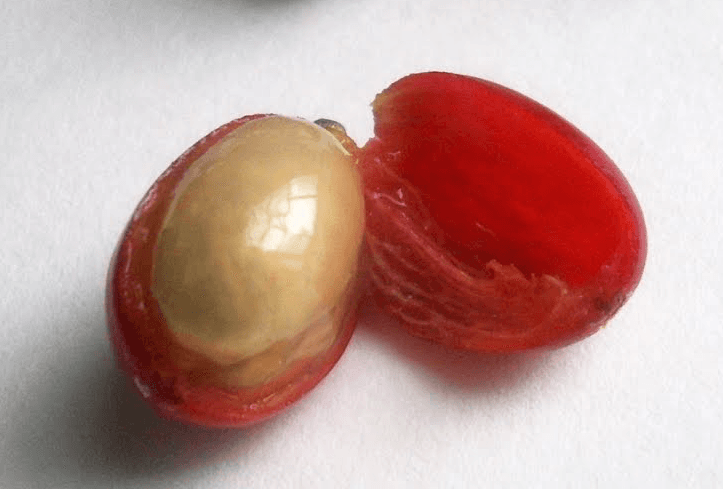 In 1722, the “London coffee man”, Humphrey Broadbent, made the pronouncement that “…most persons of distinction in Holland roast their own berries.” Also, he was quoted as recommending every family roast their own coffee berries, to avoid certain pitfalls that befall those who don’t do this, such as burnt berries. Clearly, coffee shop hipster-ism was beginning to take hold even then. 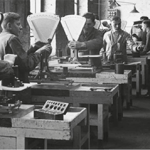 Since I have already failed any sort of brevity in this article, I could simply just continue…BUT, I will conclude this history of coffee grinders now, before I continue any further. Will there be a sequel to this? There very well could be, since we’ve only barely just arrived in the 18th century, and there are three more centuries to cover.